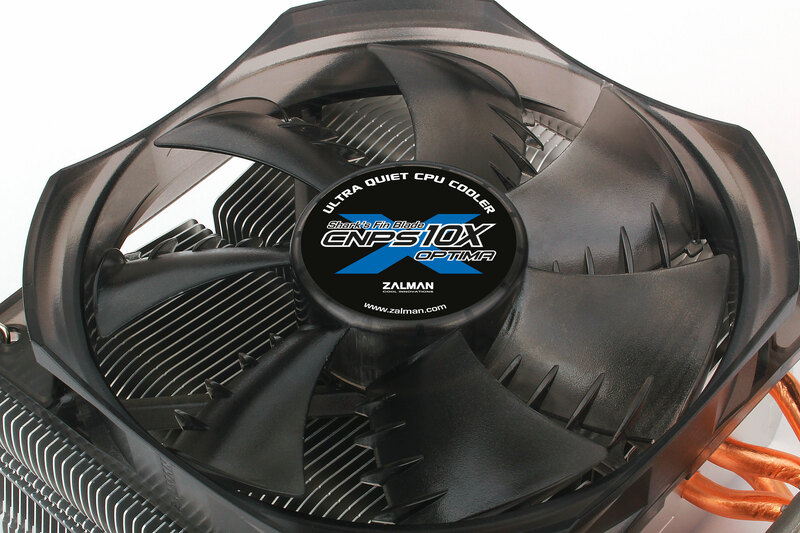 Zalman's latest incarnation of the CNPS10X, the CNPS10X Optima offers direct touch technology and a shark-fin 120mm fan to provide excellent cooling at an exceptional price. 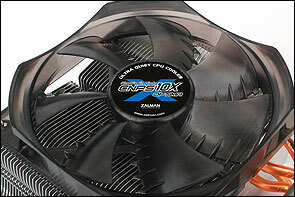 Zalman's CNPS10X Optima is their fifth cooler to be branded with the 10X moniker and offers the best bang-per-buck yet. 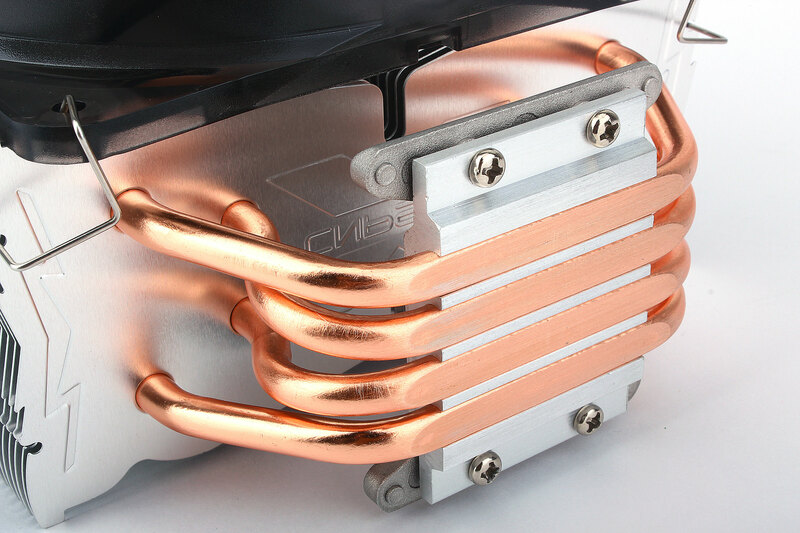 It features Zalman's Direct Touch Heatpipe technology on all four U-shaped heatpipes which are designed to transfer the heat quickly and efficiently to the aluminium fins. The "Shark-fin" design on the blades of the 120mm PWM fan reduces turbulence and reduces any possible noise or vibration. 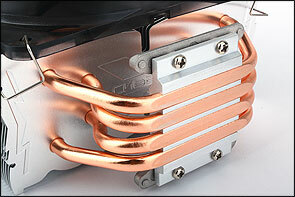 It is even possible to add a second fan to the heatsink with the provided clips. Direct Touch Heatpipe (DTH) Base technology transfers the CPU's heat directly to heatpipes, thereby minimising heat resistance and maximising cooling performance. Sharks Fin Blade Fan greatly reduces the turbulence caused by fan rotation, thus decreasing the noise and vibration while increasing the airflow. Very good cooler, but one noisy fan! 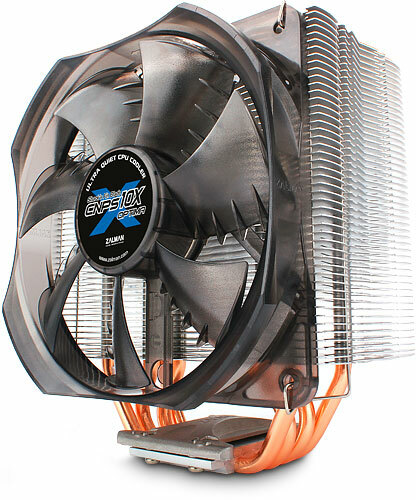 I bought this to build a quiet PC for a very demanding customer who wanted another silent PC to replace their ageing single core Athlon Scythe Ninja passively cooled machine (Antec P150 case). Height constraints inside the Nanoxia Deep Silence case meant this was about the tallest I could go with a 12cm fan equipped cooler without breaking the bank. The packaging and contents looked suitably impressive for a very affordable cooler and installation was a breeze thanks to the included instructions and the motherboard CPU socket cutout in the case back plate. I was mighty disappointed though with the included fan which I found to be very noisy. Even with the BIOS CPU fan control set to 'Quiet', the fan is anything but silent. It emits a very loud rumble. Luckily though, the 3.2GHz G3420 Intel Pentium Dual Core Haswell CPU runs cool enough with this cooler in passive (i.e. fan disconnected) cooling mode, so that's how I ended up using this cooler. With the case fans on low speed and the CPU cranked up to 100% utilisation over a few hours, the CPU temperature never rose above 40 Deg C which in my mind is outstanding. End objective of building a silent PC was nearly achieved thanks to the cooling ability of this heatsink with a low power CPU. Normally I use Arctic Silver 5 thermal paste, but this time I simply plumped for the included Zalman stuff and it was fine. So all in all, an excellent heatsink let down by a noisy fan, but don't let that put you off, as you may find you can run in passive mode, or pair it with a quieter fan if you have a CPU that runs hotter. I love this shop. CNPS10X Cooler, not so much! UPDATE 25.01.2014:When you install a new cooler you must give a time to the thermal paste to settle. It can effect minus 1 or 2 C's more. It did on this one too. Now Idle temp. did not surprise me but 100% load temp really shocked me. It dropped to 50C & after 30 Min. of working it was still there. SO it wasn't all that bad cooler after all.